Everyone should feel safe at home, and chances are, you do. But inside every house lurk dangers, from poisons to fire hazards. How can you make sure that your home is truly safe for you and your family? Choice Home Warranty’s Home Tragedy Prevention Guide offers a complete overview of common home hazards that can have disastrous consequences. While you can’t stop every tragedy at home, there are many that can be prevented by taking simple steps like testing your smoke alarm, or storing firearms in a safe. The guide offers practical advice for safeguarding your home from dangerous, but preventable, hazards. 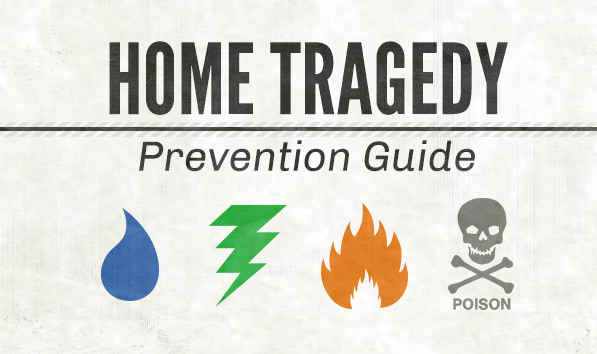 Visit the Choice Home Warranty Home Tragedy Prevention Guide to find out how you can protect your family from drowning, electrical shock, burns, fire, poisons, and more.